Recorded in 1955; Lp released in 1956. Cover photograph courtesy M.G.M. Pictures—producers of "Forbidden Planet"
Note: The tracks from this album were never released in stereo. 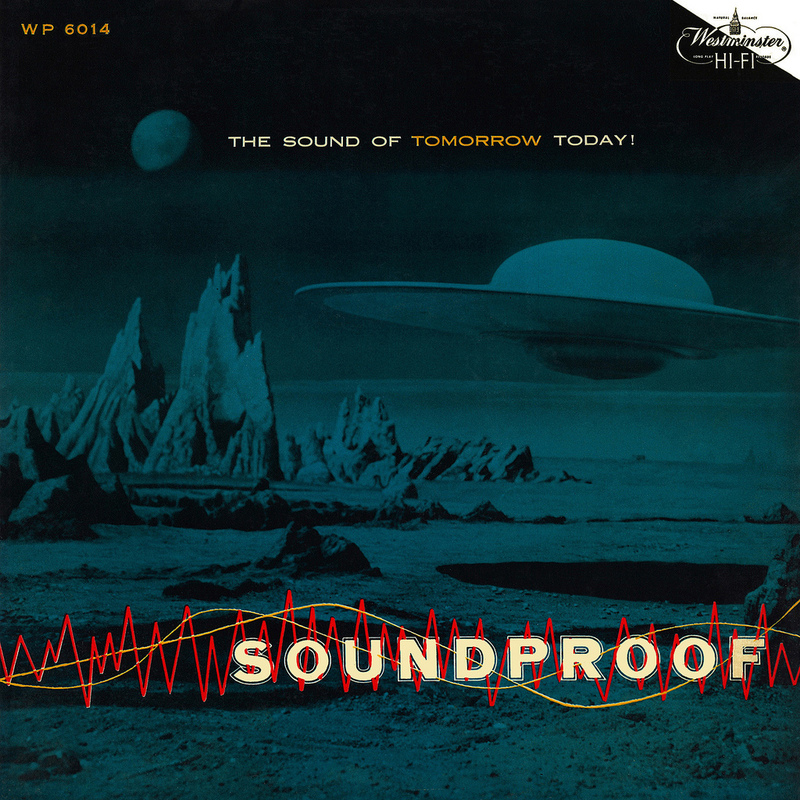 The stereo Lp titled Soundproof features a stereo mix of Soundblast (Westminster WST 15011). THE SOUNDIF YOU DO NOT HAVE THE finest high quality audio equipment, don’t bother to play this record. For here, Arthur Ferrante and Louise Teicher present some of the most unusual, massive, and baffle-busting arrangements ever recorded. In fact it is absolutely the last word in effects recording, utilizing two gimmicked Steinway grands and multi-channel, five-track stereophonic recording coupled with the most unusual electronic effects you have ever heard. If you are a fan of hi-fi and great recorded sound you might enjoy guessing the gimmicks. Each piece contains a new gimmick not used in the one before. We are sure you have seen records boasting “frequency response 16 — 22,000 cycles,” where the instruments in question have no fundamental lower than 100 or higher than 12,000, but the same cannot be said for this record, for if the fundamental in question does not lie within a range Ferrante and Teicher want, they merely relocate it to any frequency with the range of human hearing by means of electronics. So many records involving gimmicks, both from a performing and an electronic standpoint, have a very cold atmosphere and very little musical value. But Arthur and Lou and their engineer have been experimenting with sound recording for years, and in this album have achieved beautiful moods—dynamic, sensual, humorous—and really remarkable variety. The recording was made through seventeen channels, utilizing four Telefunken U-47, four Altec 21-C, four Altec 21-D, and five specially designed microphones. These channels were multed through four 6 channel mixers for simultaneous monaural and stereophonic recording, feeding modified 30” Ampex 301 machines, adapted for 14” reels, with our own specially designed record and playback amplifiers. Three 60-watt amplifiers were used for monitoring at the sessions. All seventeen mikes were placed on movable suspended booms in such a way that their movement could be controlled from the booth while the recording was being made. This record was processed from 30” original tapes according to Westminster’s new and revolutionary “Panorthophonic”® technique on continuously variable-pitch Scully lathes equipped with Western Electric feedback cutters. The finished records, were then A·B-ed against the original master tapes to insure an absolute match to the original sound. The R.I.A.A. characteristic is used for this recording. To achieve the greatest fidelity, each Westminster record is mastered at the volume level technically suited to it. Therefore, set your volume control at the level which sounds best to your ears. Variations in listening rooms and playback equipment may require additional adjustment of bass and treble controls to obtain NATURAL BALANCE. Play this recording only with an unworn microgroove stylus (.001 radius). For best economical results we recommend that you use a diamond stylus, which will last longer than other needles. Average playback times: diamond—over 2000 plays; sapphire—50 plays; osmium or other metal points—be sure to change frequently. Remember that a damaged stylus may ruin your collection. True high fidelity creates "the illusion that the listener's chair is the most favored seat, acoustically, in the concert hall.” This demands clarity, range and, most vital of all, balance, the natural balance of the original music, faithfully recreated. This is Westminster’s “NATURAL BALANCE.” Listen — and Compare. 11/24/2017 - I just received the Del Ray reissue from Amazon. Haven't listened to it yet; not sure if I'll ever break the seal. Today I only buy records for the cover art and this one was worth the $30 pricetag!